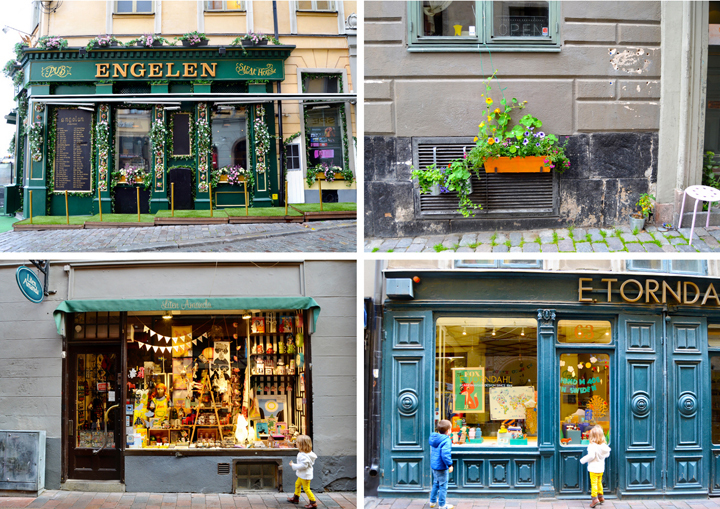 On Monday July 27th 2015 we visited Stockholm, Sweden. It was the departure point of our cruise and we were excited to explore this city before we sailed away. We got a cab early in the morning from the port into Gamla Stan, Stockholm's historic island core. It is charming, photogenic, and full of antique shops. Our nice Swedish cab driver let us out right in front of the Royal Palace, the official royal residence. It was designed in the Baroque style and completed in 1754 after a fire wiped out the original structure that was here. The exterior just underwent a 20 year renovation so it was looking spiffy. Near the water in front of the Royal Palace is a statue of King Gustav III. Gustav turned Stockholm from a dowdy Scandinavian port into a sophisticated European capital, modeling the buildings on ones he had seen in Paris, Vienna, and Berlin. Behind the nearby Finnish church is the fist-size sculpture Iron Boy, the tiniest public statue of the 600 or so that dot Stockholm. Fox was amused. Our two offspring exploring the Gamla Stan. Rick Steves' self-guided walk led us to what he called his personal phone booth - the Rikstelefon, lol. Looking up the street towards the Stortoget, the old town square. The Evans Family in Stockholm, Sweden on Monday July 27th 2015. The Stortorget is Stockholm's oldest square and is ringed with gable-topped buildings. 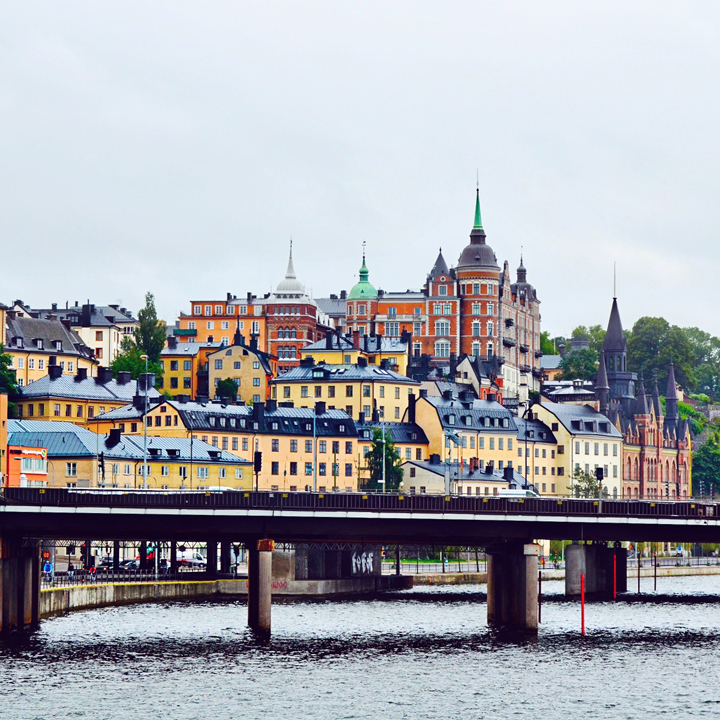 It was the heart of medieval Stockholm. The square is also home to the Nobel Museum housed in the old stock exchange building which was opened in 2001 for the 100-year anniversary of the Nobel Prize and tells the stories of the prize and those who've earned it. 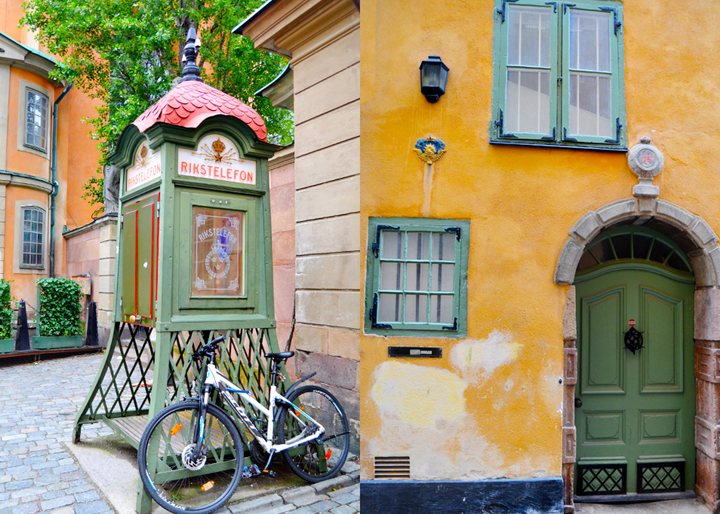 I loved the colors of the Gamla Stan buildings, all shades of ochre and sienna. Down Prästgatan lane we found a cannon barrel guarding a Viking-age rune stone. Clearly paint had been applied to highlight the runes, but it was cool to see. As we were walking, Chris reassured me that there was a "viewpoint" that Rick was leading us to. I was so excited because views are my favorite! Well, here is the view he lead us to, wah wah. He basically just wanted to point out that this marked the old shoreline of the island. But no worries, we did find good viewpoints later. By this point the kids were wanting a snack and we needed some more bottled water so we stopped in a local store and lo and behold what did they have? Real Swedish Fish! When in Sweden! 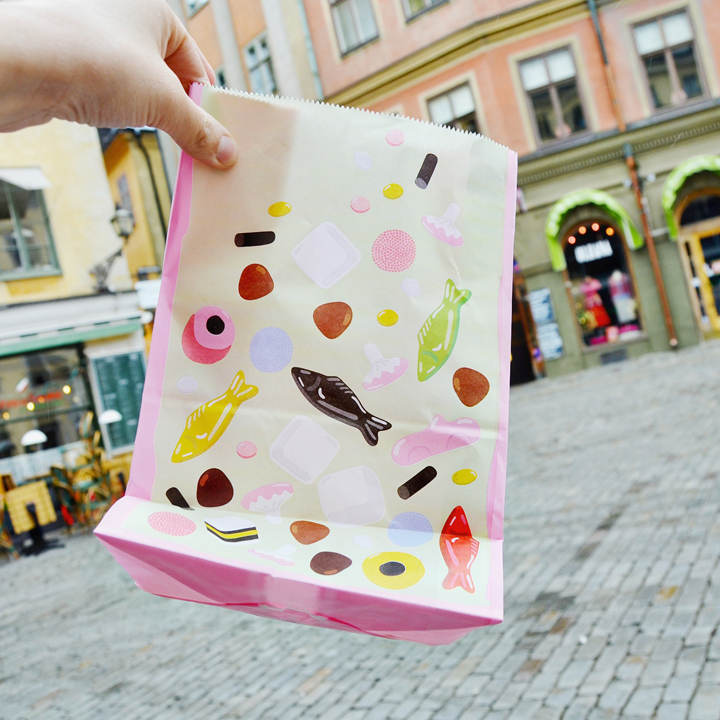 We bought a small selection including two of the original flavor, the little black ones in the bag. Chris took a bite and literally almost gagged. His words, "That is the worst thing I've ever eaten." Probably a little hyperbolic, but I still love him. A few days later he forced me to try the other one and it was like black licorice saturated with salt. So much salt. At least he found a Mountain Dew in the same store to wash away the taste. When we reached the end of the Gamla Stan island we were rewarded with a view! Gorgeous Stockholm! Stockholm more than any other city had shops that I would have loved to spend hours (and hundreds of dollars) in. Almost every store we passed was right up my alley. Cool Sistine Chapel-themed Italian restaurant in the old town. The Swedish Parliament building is located just off the old town island. Looking back towards the Royal Palace as we made our way to Djurgårgen island. Along the harbor is a fine row of buildings on Strandvägen street. Until the 1850s this area was home to peasant shacks, but as Stockholm entered its grand age it was cleaned up and replaced by fine apartments, including some of the city's ritziest addresses. Tiger Woods and his Swedish wife shared a home here in happier days of their now defunct marriage. Another stroller-selfie of the Evans Family in Stockholm, Sweden. Loving the architecture all over this town. And by now you should know that I am sucker for ivy-covered buildings. It was a hot, sunny day (after a rainy morning), so this shady path as we walked towards our next stop was very welcome. Our destination was Djurgården - Stockholm's lush park island with some of the city's best sites, such as the Nordic Museum visible here. Looking back on Stockholm as we crossed the bridge to Djurgården. 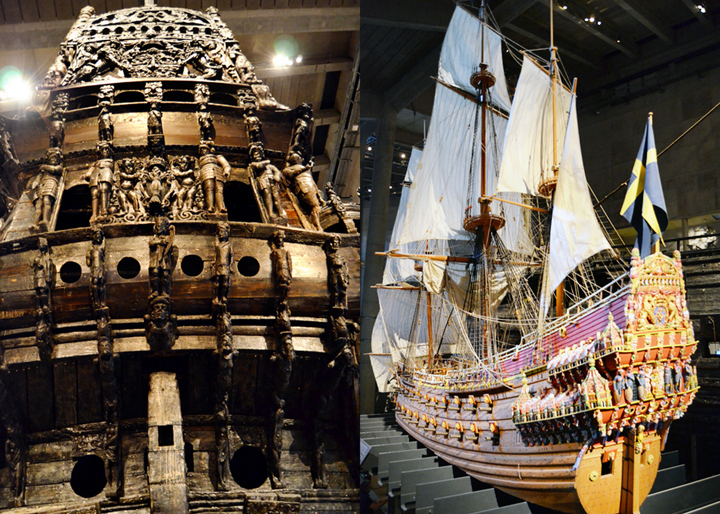 While the island has three museums, we had our hearts set on one in particular: the Vasa Museum. 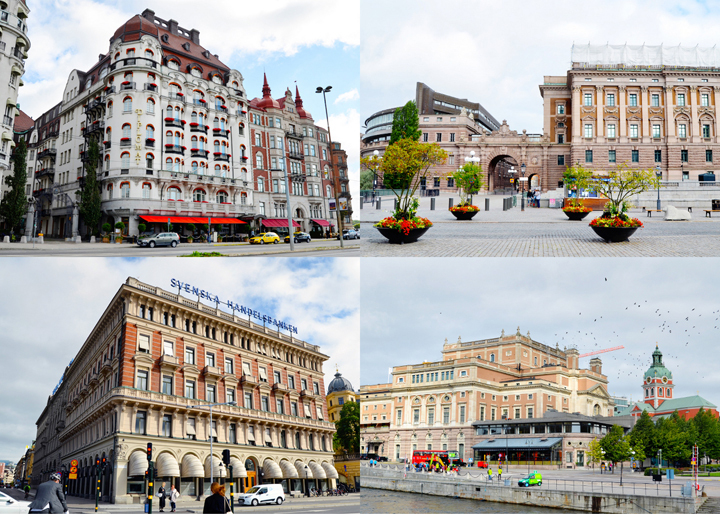 Stockholm turned a gigantic flop into one of Europe's great sight-seeing attractions. 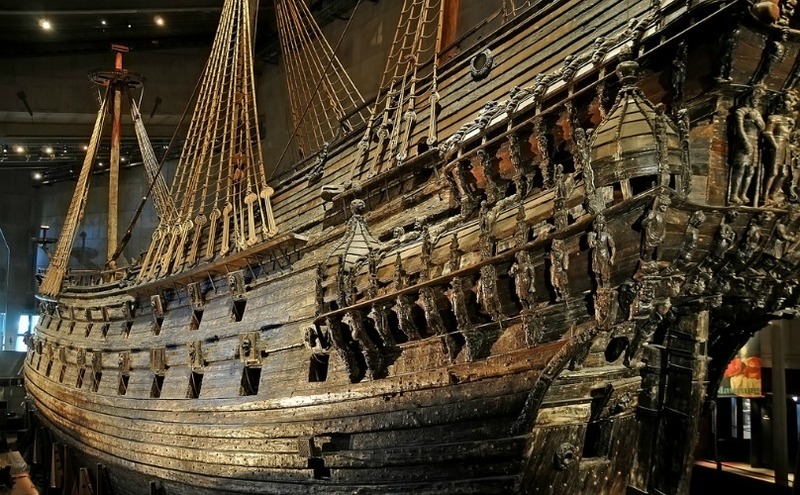 The glamorous but apparently unseaworthy warship Vasa sank just 40 minutes into her 1628 maiden voyage when a breeze caught her sails and blew the top heavy (they put in an extra cannon deck for more firepower) ship over. After 333 years at the bottom of Stockholm's harbor, the glorious ship rose again from the deep with the help of marine archeologists. Rediscovered in 1956 and raised in 1961, this is the best-preserved warship of its age anywhere and since 1990 it has been housed in this brilliant museum. Love this model of an old ship against the aqua background. No matter what angle, what floor, which corner of this museum/warehouse I was in I could never fit the entire ship in my camera! This ship could house roughly 450 people while defending them with 64 guns of varying size. It weighed 2.6 million pounds and stood a little less than 200 feet tall. The enormity of this ship can never be this 10x6" photo. If you’re ever in Stockholm you HAVE to visit it. 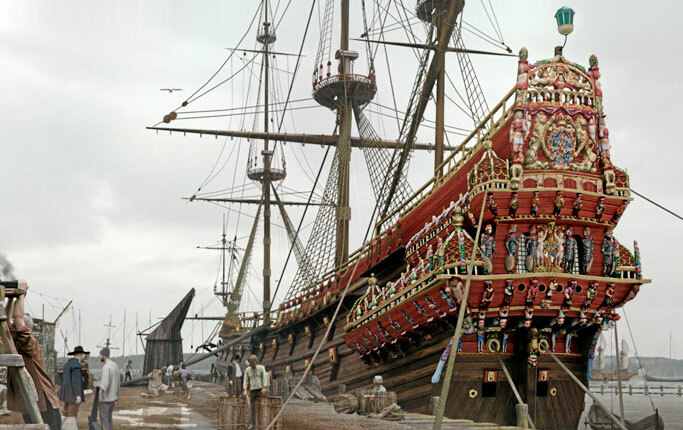 "On Sunday, the 10th of August, 1628, Vasa lay rigged and ready for sea just below the royal palace Tre Kronor. Ballast, guns, and ammunition were all on board. On the quays and shores along Strömmen, an excited public waited to watch the ship leave Stockholm and celebrate her departure. Over a hundred crewmen were on board as well as women and children. The crew had permission to take family and guests along for the first part of the passage through the archipelago. For the first few hundred meters, Vasa was warped along the waterfront with cables from the shore. The ship did not begin to sail until she reached what is now Slussen. Sailors climbed the rigging to set four of Vasa’s ten sails. A salute was fired and Vasa slowly began her maiden voyage. Once Vasa came out from under the lee of the Södermalm cliffs, the sails could catch the wind, but the ship was tender and heeled over to port, then heeled again, even farther. Water rushed in through the open gunports and the ship’s fate was decided. Vasa sank, after sailing barely 1300 meters. The crew threw themselves into the water or clung to the rigging until rescued, but not all managed to save themselves. Eyewitnesses differ on the exact numbers, but perhaps 30 of approximately 150 people on board died in the loss. After the ship was raised in 1961, the remains of at least 16 people were found." Colorful re-made pieces of the boat. The front of the boat and a model. What the ship looked like before sailing (no-so-far) away. We let the kids pick a toy from the shop and they both (of course, cuz Jane wants whatever Fox wants) got a stuffed rat, lol. We got many-a comments on those things. Also on the island is the Nordic Musuem which is in a gorgeous building built to look like a Danish Renaissance palace. It offers a peek at 500 years of traditional Swedish lifestyles. The majority of the island, however, is lovely parkland. 400 years ago Djurgården was the king's hunting ground. Now the entire lush island is protected as a national park and still has a smattering of animal life among its biking paths, picnic areas, and open spaces. The lovely buildings of Stockholm from Djurgården island. Fancy royal blue gate to one of the parks on the island with kids who happened to match perfectly. Thus concluded our time in Stockholm. We had a little trouble finding the right bus to get us back to the port, and buying a ticket for that bus, but eventually we made it back and didn't get left behind since we were set to sail out that afternoon. Sailing out of Stockholm was BEAUTIFUL. So much greenery and beautiful homes and a lighthouse to boot! I loved Stockholm, especially the Vasa Museum. Great recap! Stockholm was a wonderful start to our mega-cruise! Gorgeous photos of a gorgeous city!! The ship story was amazing!!!!! That ship is AMAZING and to think it was to be a war ship, right? So ornate! I love these posts of your travels! They always need me to go read up on the history of some new discovery you've uncovered for us! Thank you!